Just setup my new X58 Extreme today. At first things were shaky but after a bios update I am very pleased. The only caveat is that I cannot get my OC 2000 Kingston memory to run at those speeds. However after the bios update I was able to get it to run stable at XMP profile 2 1866. I am content with that as I don't want to spend a great deal of time tweaking the timings. 1866 is plenty fast. For reference here is the module I used. The whole reason I purchased that ram was because it was posted on the motherboards compatability list. Oh well. 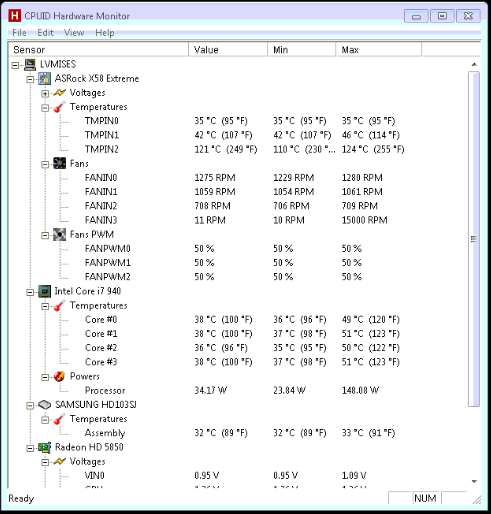 The reason I am posting today is because I am getting odd readings on CPU-ID Hardware monitor for temperatures. I have read some similar posts about this and most people say it's safe to assume that the thermometer is just bad and that there is no real reason to be alarmed. Given that my other temps appear to be cool I don't think I have much to worry about. Still I thought I would post it for you folks to review just to be safe. Is TMPIN2 something I should be concerned with? Do my fan's appear to spinning at a normal speed? (I am not sure what normal is, I thought 1200rpm was fairly standard) I'd hate for them to be spinning extra fast because of a broken temp reading. Furthermore TMPIN2 usually takes over a minute to load in the HW monitor, which gives me further reason to beleive its just messed up.